The site occupied by Shanklin Theatre was given to the people of Shanklin by Mr. Popham-White, the Lord of Shanklin Manor. Building Shanklin Literary Institute was funded by public subscription and opened in 1879, it also included Shanklin Town Hall. 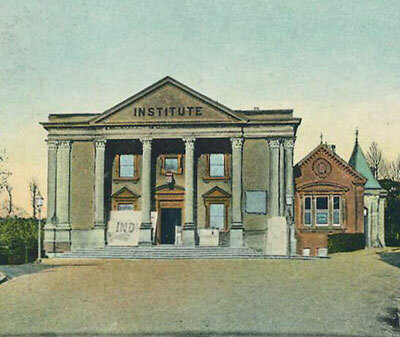 A Reading Room and an Amusement Room were added to the Institute in 1884. In 1913, the town council dictated that the building should no longer be known as Shanklin Literary Institute but rather the Town Hall. A fire seriously damaged the Institute part of the building in 1925; repairs were delayed as the Shanklin and Sandown councils were in the process of combining and there was disagreement between the two sets of councillors. Eventually repairs were carried out and the building reopened in 1934 as a Town Hall and Theatre. The Theatre has continued since. The Town Hall became a local council office for the South Medina Council in 1974; it ceased this function on creation of the Isle of Wight Council as a Unitary Authority in 1995.